Conveniently located in Sunny Isles Beach between Fort Lauderdale and Miami, Trump International Beach Resort Miami offers guests easy access to many of the city’s most popular attractions, as well as the renowned dining, nightlife and shopping that have made Miami one of the world’s most sought-after and celebrated destinations. 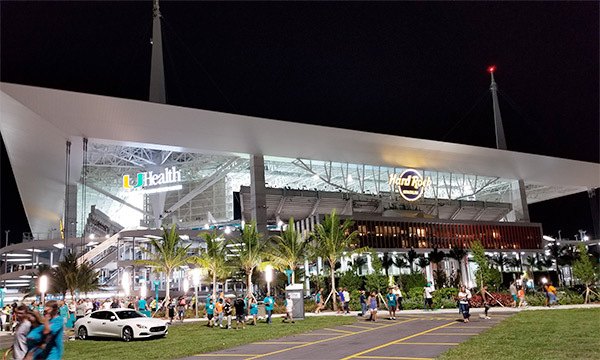 Hard Rock Stadium is home to the Miami Dolphins, University of Miami, the Miami Open and many global events. Our beach resort is a quick drive or ride-share away, located just 9 miles to the east. Whether you’re here for a beachfront wedding, an executive retreat or a family vacation, you’ll discover that our oceanfront resort is the perfect home base for exploring all that Miami has to offer. To get you started, here are a few not-to-be-missed attractions in Miami and Sunny Isles Beach. Spanning more than 1,000 acres, this popular state park features a beach, picnic areas, bike trails and kayak rentals. Newly reopened, this historic pier is the only public fishing pier in Miami-Dade County. Formally known as St. Bernard de Clairvaux Church, this 12th century Spanish monastery cloister is one of the oldest buildings in the Western Hemisphere. Catch a glimpse of 960 historic Art Deco buildings in South Beach. This popular pedestrian mall is lined with shops, restaurants and galleries. Upscale, open-air shopping at its best. Three floors and 300 retailers make this upscale mall a must-see stop. Exhibits, demos and interactive displays celebrate the appeal of sportfishing. A historic racetrack, county casino and popular concert venue. This 50-acre estate features a villa, formal Italian Renaissance gardens and jungle forest. Spanning more than 1.5 million acres, Everglades National Park features year-round camping, birding, hiking, off-road cycling and airboat tours. Perez Art Museum Miami – 1103 Biscayne Blvd. Located in Museum Park, this contemporary art museum showcases international art of the 20th and 21st centuries. Interactive exhibits and programs celebrate the arts, culture and community of multicultural Miami. Designed by sculptor Kenneth Triester, the Holocaust Memorial honors the six million Jews who died in Nazi concentration camps. Reptiles, penguins, flamingos and even a liger call this interactive zoological park home. This 750-acre zoo is the largest and oldest zoological park in Florida. This 38-acre oceanarium near downtown Miami, one of the oldest in the U.S., is home to sea turtles, sharks, manatees and more.